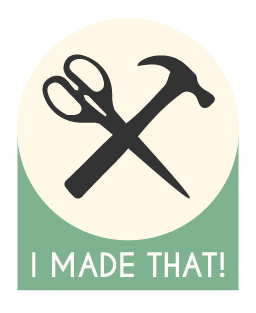 Thirty-Two: Daisy Dishcloths – I Made That! I’m a Chux women, sponges just aren’t my preferred washing implement. 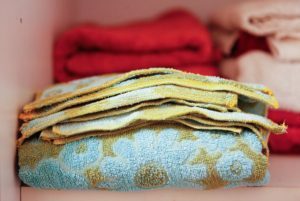 The need to use a dishcloth has stayed with me and as we’re trying to move away from household items that have a limited lifespan we’ve been looking for other options. When we first moved in together Simon purchased some Full Circle dishcloths, which are made from 100% organic cotton and have loops in the fabric to help with scrubbing. They’ve great to use and we just keep them cycling through the wash so we’ve got a fresh one when needed. However, I’d prefer something that uses recycled materials, why deplete the worlds resources further? I came across a good DIY option when we were holidaying in Tassie earlier this year. 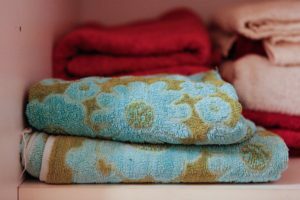 One of our Air BnB’s had dishcloths made from retro towels, they looked fantastic and did the job of dishwashing well (the pile of towels makes these dishcloths good for scrubbing). So, I filed this project away in my mind. 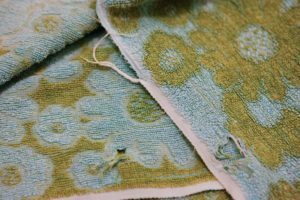 I noticed recently that our exisiting dishcloths were getting towards the end of their lives, so one evening I plucked an old school towel that was getting ratty around the edges from our linen cupboard and got to work. 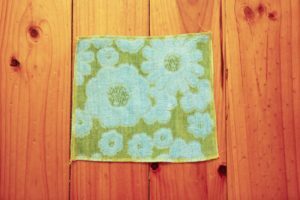 Making them was simple, I cut the towel into squares (or squarish shapes) and simply overlocked around the edges. My overlocker thread collection is limited, but thankfully the bright yellow I had contrasted well with the blues and greens. I think it took me about 15 minutes to complete this project and now we have eight daisy dishcloths ready to put into rotation!